A professional photographer with over 20 years of experience, I love sharing my enthusiasm and knowledge of photography -- in particular street photography and visual storytelling. My work has been exhibited & published in newspapers, magazines, & books. I teach photo classes at LA Valley College, SMC, & organize street photo workshops. I work with teens in an after school program at Culver City Middle School & mentored at Venice Arts. Inspiration! Encouragement! Confidence! Join me! 6 week class covers skills needed to master control of your camera—film or digital. Step-by-step instruction to learn photo fundamentals with an emphasis on manual exposure mode, understanding auto modes, shutter speeds to stop or blur motion, ISO, white balance, controlling focus, flash, and more. Camera practice assignments given. Informative handouts and individual attention. This class is about creativity and making dynamic images beyond snapshots. The emphasis is on seeing, composition, light and, bringing meaning to images. We'll cover camera angle, lens choice, creative use of f-stop and shutter speed, filters, using flash outdoors, and more. You'll learn about various genres of photography and develop your own individual style. There will be a Saturday daytime meeting to go out shooting. Whether wanting to improve your photos, get helpful feedback, or do more photography this class is sure to inspire you. Learn to make beautiful outdoor portraits in daylight, with and without using flash. Workshop will focus on posing your subject, picking locations, observing ambient light, and enhancing it. We’ll start in the classroom to discuss principles of light, flash exposure, and good portraiture—then go outside to practice & create portraits that look professional, with flattering light and a blurred background. Nice portraits can be made with any camera, though DSLRs & cameras with manual options are recommended for class. Class will guide participants to understand the photographer’s essential role in making a dynamic photograph that is thoughtfully composed and that communicates the photographer’s intent. Learn to use your photography to evoke emotion and humor, to preserve a memory, and to tell a story. Any camera may be used, though cameras with manual operation allow more options. Your eye and "seeing" is most important! DESCRIPTION OF S&R: Street photo walks and more! Independent photo walks and reviews! S&R consists of 6 meetings. Three meetings are SHOOTING excursions & 3 are REVIEW meetings. Sunday afternoon excursions are at various interesting locations, and participants explore in groups or on their own with me. REVIEWS give everyone a chance to show photos from the excursions, discuss experiences, get supportive feedback, and see the variety of ways others handled the same photo ops. It's friendly, informal, & fun. Great opportunity to gain confidence with "street photography" and enjoy a common interest with other photographers! SHOOTS are on Saturdays or Sundays REVIEWS are on weekday evenings 7:00 to 9:30 (Location on Westside / occasionally in SFV). Interested in the next one? Sign up to my newsletter & stay in the loop. For PayPal, please use "Send to Friends and Family" to eliminate surcharge. TEEN/ADULT WORKSHOPS • 12-17 yrs / Adults attend free! SUMMER 2019 • WHO CAN ATTEND? Students age 12 to 17 have the option of attending this LAVC workshop with an adult. However, students age15 and under MUST be accompanied by an adult for entire workshop. NOTE: Bring camera, user manual, something for note-taking, and a sack lunch (30 min. lunch break). 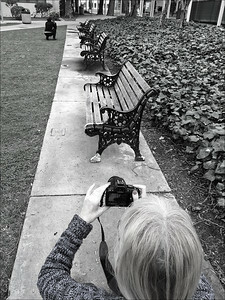 Workshop-style class introduces basic principles of photography. Learn how motion, light, and focus can be used in creative ways. Topics include: key elements of exposure--shutter speed, f-stops, and ISO. Activities help students apply new skills to photographic self-expression. No prior photo knowledge is required. Bring to class a camera with manual exposure options. All students are encouraged to attend with one adult (no charge for adult). Building on basic camera skills participants learn to make creative pictures that have a personal point of view. Workshop-style class is about the photograph and principles of visual composition. Discover how light, angle, and camera techniques help to make photos beyond snapshots. Hands-on photo activities guide student to apply new concepts and make photos that communicate their vision. HAND COLORING PHOTOS TBS (See Facebook page for examples) Learn the art of hand-tinting photographs --- adding color to black-and-white photography with paints & pencils. In this hands-on class, we'll cover this mid-19th century art as well as how to paint on digital prints. Whether you choose to add color to an entire image or selective portions, the result will be a unique piece of art! Learn about personal projects & grouping photos by theme or subject to take your photography to a greater level of communication. We define your project and select meaningful images that work together. Whether wanting to organize travel photos or work on a personal photo essay, this class provides feedback in a small group setting. Create a cohesive body of work with a visual narrative, using an artist’s statement, learn how to create meaningful images, choose images for presentation, and more! All levels of photography skills welcome, and any camera may be used. Repeat students welcome. This is a great opportunity to share your photography, get feedback, & start or further ongoing projects. An abbreviated class for beginners, class covers fundamental concepts to understand your camera. Ideal refresher or overview of SLR cameras. Topics include auto vs. manual settings, the exposure triangle (how ISO, shutter speed, and f-stop work together), and more. Camera practice and review of photos at workshop. Offered in summer session. I'm open to any photo class ideas and I'm available if you have a group wanting your own class. "I can already tell, taking this class right away was a good decision! I'm really looking forward to it." Tracy B. "I wanted to thank you again for being such a patient and gentle teacher. I really am grateful for invaluable, personal time you take to help me learn the art of photography. The outings have been extremely beneficial...Again and again, A Million thanks~ Sue B. "I enjoyed the classes very much and have been recommending them to my [High School] students when they express interest in photography...Thanks again. I'm still enjoying working on what I learned on your class! " Alaina K.
"Just want to say "thank you" for a wonderful workshop. It was a great opportunity to practice as well as receive input from others. Please keep me posted when you have other classes." Tracie B. "Thanks again for a very enjoyable and informative class! It was a lot of fun." Bob G.
My independent photo workshop consists of group photo shooting excursions & a chance to review everyone's photography. Open to all levels and any camera may be used. Please contact me for details. SHOOT LOCATIONS GIVEN TO PARTICIPANTS / REVIEW LOCATION T.B.D.